Koenigsegg is on a roll right now. The Agera RS is world-famous after smashing several speed records last year, and the Swedish automaker recently unveiled its replacement car, the 1,600-hp Jesko, at the Geneva Motor Show. Behind the scenes, the company has also been rebuilding cars damaged from accidents, the most famous of which is the One:1 that crashed at the Nurburgring a few years ago. Back in 2016, Koenigsegg attempted to set a new Nurburgring production car lap record in the One:1 and beat the Porsche 918 Spyder’s record time of six minutes and 57 seconds. Christian von Koenigsegg suggested the One:1 could do a 6:40 'Ring lap on a perfect day. Unfortunately, an ABS failure caused the 1,340-hp hypercar to lose control during the record attempt and smash into a barrier before it had completed a lap, launching the car 72 feet in the air. A fire also broke out, but the driver luckily managed to escape and was released from hospital the same day. 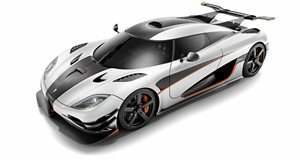 The hypercar was severely damaged, but Koenigsegg promised to rebuild it since only seven examples of the One:1 were originally built. Three years later, the car has finally been restored to its former glory. A photo posted on the company’s Instagram page shows the car on display at the ceremony of Carage, a brand new Koenigsegg dealership in Lucerne, Switzerland. Why has it taken so long for the One:1 to be rebuilt? Remember, it wasn’t long ago when Koenigsegg's waiting list was over four years long, which meant the company urgently needed to expand and optimize its production facilities. The company has also been busy producing the Agera and the Regera while also developing the Jesko. Hopefully, it won’t be long until Koenigsegg attempts another Nurburgring lap record with the new Jesko hypercar.